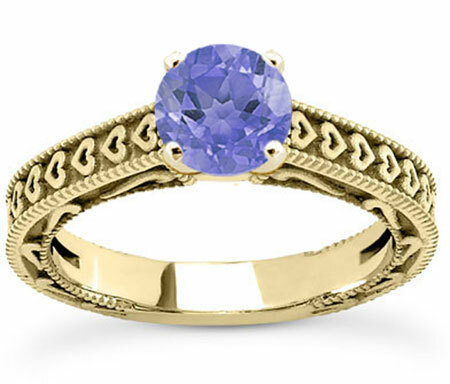 Tanzanite is a stunning stone, and it appears as a beautiful, sparkling purple in this engraved heart violet tanzanite engagement ring from Apples of Gold Jewelry. Set in 14K yellow gold, the band of the ring has hearts on the outside, adding a little romance to an already beautiful engagement ring. Capture her heart with this soft violet gemstone, which is genuine and measures an impressive 6.5mm in size, which is perfect for this design. The A rated stone will pop against the 14K yellow gold! We guarantee our Engraved Heart Violet Tanzanite Engagement Ring, 14K Yellow Gold to be high quality, authentic jewelry, as described above.